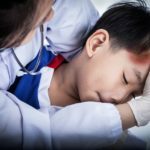 A multidisciplinary group of experts, assembled to reflect a team approach to treating pediatric patients with severe traumatic brain injury (TBI), have released updated evidence-based guidelines for 2019 to optimize critical care and improve outcomes of critically ill children with TBI. This report was published in Pediatric Critical Care Medicine and endorsed by the American Association of Neurological Surgeons/Congress of Neurological Surgeons. Researchers performed a systematic review, assessment, and synthesis of literature on studies focused on the management of severe TBI in pediatric patients. Topics were carried forward from the Second Edition and were organized into 3 categories: monitoring, thresholds, and treatments. In the second phase, clinical investigators evaluated evidence for treatment strategies using the guidelines to derive evidence-based recommendations. Recommendations developed for each topic were designated as level I, level II, or level III based on the quality of evidence. Clinicians recommend that intracranial pressure (ICP) is measured to determine the presence of intracranial hypertension, especially because no imaging or biomarker tests are available to indicate intracranial hypertension in pediatric patients. ICP monitoring has greater capabilities for detecting elevated ICP compared with not using an ICP monitor, and allows for the timely delivery and appropriate titration of treatment. This recommendation is unchanged from the Second Edition, but the lack of controlled trials limits the recommendation strength. In patients with severe TBI, advanced neuromonitoring techniques like microdialysis, electrophysiology assessments, and cerebral autoregulation examination can help identify specific treatment needs of individual patients and can be further used to monitor functional outcomes associated with treatment. Advanced neuromonitoring is only suggested for patients with no contraindications for invasive neuromonitoring, such as coagulopathy, or who do not have a diagnosis of brain death. If the brain tissue oxygenation monitoring technique is used, clinicians recommend maintaining a level >10 mm Hg to improve overall outcomes. This recommendation is unchanged from the Second Edition, and insufficient evidence regarding monitoring outcomes or thresholds limits the recommendation strength. Computed tomography (CT) examination of the head is the current preferred neuroimaging technique recommended for detecting intracranial injury, signs of mass effect, or cerebral edema in patients with severe TBI. However, due to lack of evidence, no rule indicating CT for ICP monitoring in infants or children with severe TBI has been recommended. Unless evidence of elevated ICP or neurologic deterioration exists, routinely obtaining repeat CT scans more than 24 hours after admission is not suggested for pediatric patients. CT examination is further not endorsed for patients in a coma. The latter recommendation is new in the Third Edition provided by 2 class 3 studies; the overall strength of neuroimaging recommendations is weak.